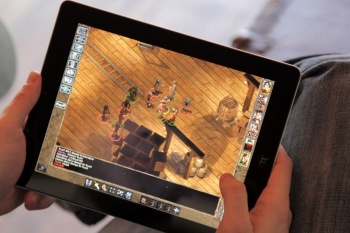 Beamdog calls the system "a toy, not a console." Though Baldur's Gate: Enhanced Edition has, thus far, only been announced for PC, Mac, and iOS, developer Beamdog has made a point of saying that its upcoming game will never make its way to the Wii U or, from the sound of things, any Nintendo console in the foreseeable future. Taking to the Twitosphere, ex-BioWare man and founder of Beamdog Trent Oster tweeted, "We don't do Nintendo development. Our previous experience with Nintendo was enough to ensure there will not be another." That means no Wii, no Wii U, and no touch-enabled 3DS port. The previous experience to which Oster is likely referring is his company's port of MDK2 to the Wii, specifically citing the company's policies in working with developers. "My problems with Nintendo are: requiring 6000 unit sales before payment, a certification process that took us 9 months and a 40mb limit," he wrote. "Nintendo isn't a good platform for developers. The Wii is a toy, not a console." Those are strong words for a company developing for the iPad, but seem to speak more of a strained personal experience than an unbiased professional stance. Still, Oster and Co. have the freedom to develop for whomever they choose, and it does appear that they have some legitimate complaints about working with Nintendo. Regardless, there are currently no announced plans to bring the game to any console, Wii or otherwise.